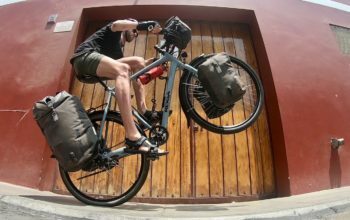 I completed a two year, 31,000km trip between Europe and Australia using a Gates Carbon Drivetrain. I started with belts on my modified Surly Long Haul Trucker and 10,000km later I used dual belts on my Co-Motion tandem. The Centertrack drivetrain has performed flawlessly on sealed roads and under all weather conditions. When it gets sandy, or when the grit on dirt roads gets fine it sometimes gets squeaky. This happened on less than 10 short sections of my trip. Stopping the squeak is an easy fix, a squirt of water and a rub with your finger but it sometimes needs to be done every 20-100km depending on the fineness of the grit. Silicone spray or Rohloff biodegradable chain lube is said to keep them silent for longer, but I never had access to these products when I needed them. In terms of maintenance, my belt drivetrain required very minimal effort. I found myself giving it a clean with a toothbrush whenever it got a bit muddy/gritty. When I stuck to sealed roads I almost never need to do any maintenance. The Centertrack chainring is now showing signs of wear. There are silver wear marks coming through the black anodising. The stainless steel rear cog looks to have a lot of life in it yet. I haven’t yet replaced either of those components since Amsterdam. After 31,000km, I’ve only just managed to break my first belt as I took off from the traffic lights. 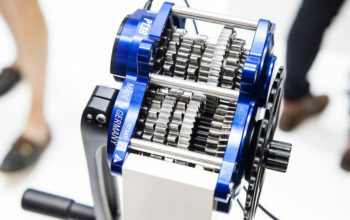 That’s some serious distance on a bicycle drivetrain! I just put a new belt on to the existing chainring/cog, so it will be interesting to see whether this belt wears quicker than the first. Belts last up to 4x the life of a chain because they don’t ‘stretch’ and wear in the same way. This is because belts have no moving components like a chain; instead they’re constructed with continuous loops of carbon cord inside a nylon/polyurethane jacket. 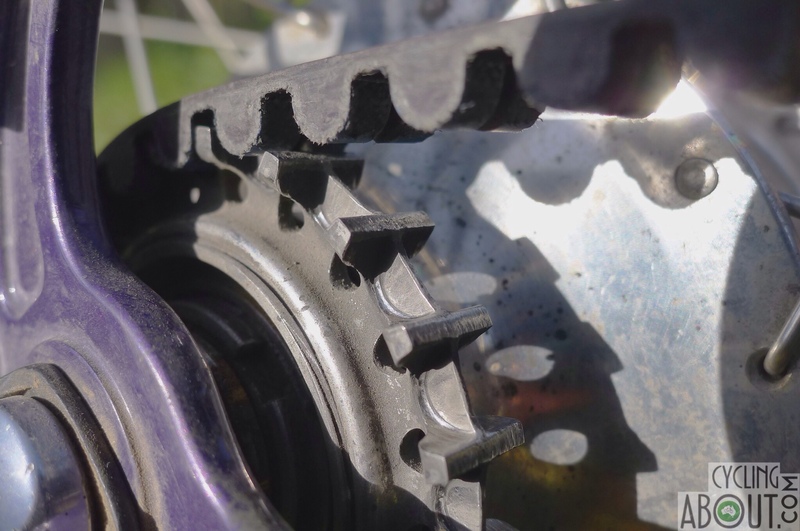 Chains lengthen over time as their components wear (pins, bushing, rollers) until eventually chains will no longer mesh well with the sprocket teeth. Belts require little to no drivetrain maintenance and don’t need to be lubricated (no greasy hands). Belts are essentially impervious to road grime and weather, and will not rust if you leave them in the rain. Belt drivetrains are almost silent on the road; instead they make a cool humming sound. 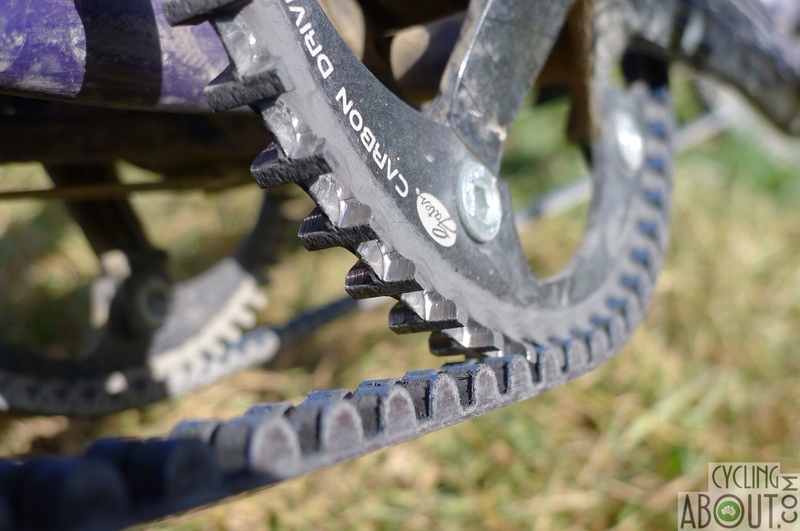 Belt drivetrains are considerably lighter than chains, in fact a cog/ring/belt is lighter than a chain alone. The Centertrack design is greatly improved over the Gates CDC belt kit. Gates have helped me out with warranty assistance when I’ve needed it. Getting a spare belt at any old bike shop is virtually impossible; it’s a send-in job. But that said, most high-end bike components need to be shipped to you anyway. I’ve always carried spare belts because they are the most likely part to break, and really don’t weigh much – just 74g. I never carried spare chainrings or cogs you have a low chance of damaging or wearing out those components. 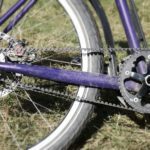 Belt drivetrains require a lot of tension resulting in a slightly less efficient drivetrain than with a chain. This tension is said to damage bottom bracket and rear hub bearings but it is my experience that the effect is minimal. 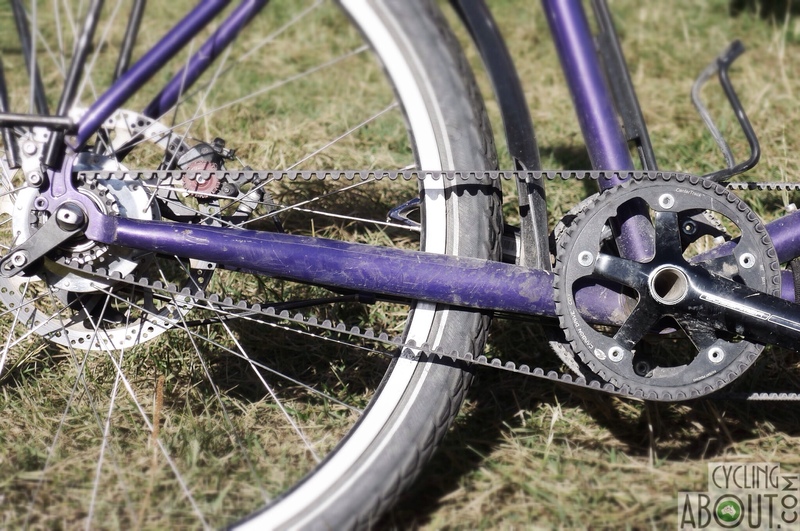 You need a belt compatible frame with a built-in tensioner to run a belt drivetrain. 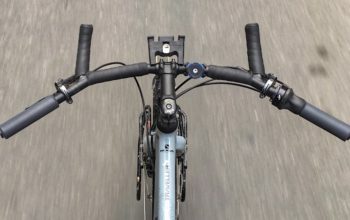 Belt compatible frames have a ‘belt splitter’ in their rear triangle and should also be stiffness test approved. Belts can make a lot of noise on sandy, dry roads. Carbon drivetrains are expensive, but I think they’re pretty good value if you consider the kilometres you’ll get per dollar invested. 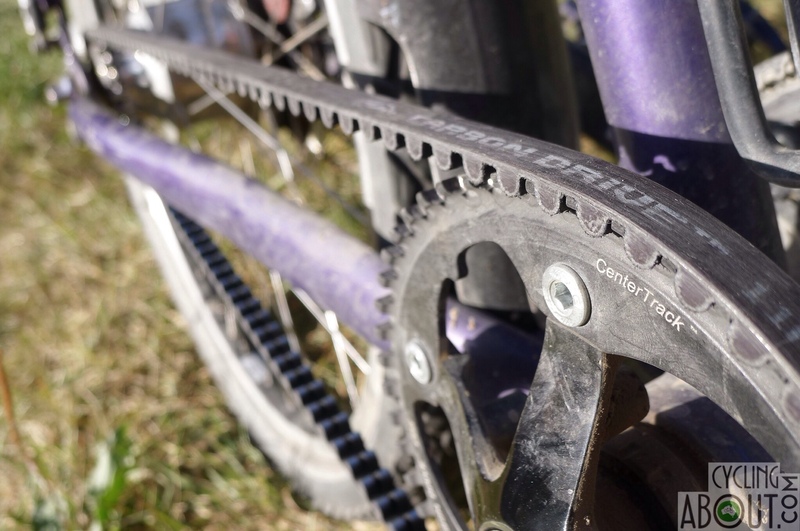 Belt lengths are fixed and only five lengths are available, limiting the drivetrain ratio options available. The Centertrack drivetrain was perfect for my two year bike trip. 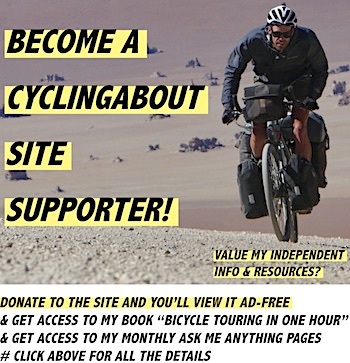 Given that 90% of my riding was on sealed roads, the silence, incredible wear life and maintenance-free nature of the Centertrack kit definitely outweighed the annoying squeaking I got on some sandy roads. 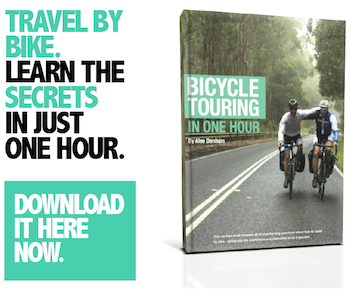 That said, I generally recommend belt drive to people who ride the majority of their tours on sealed roads. 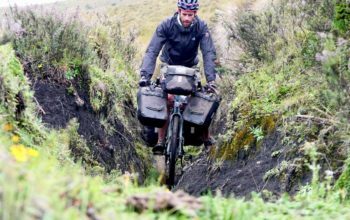 Those who spend more time on dirt than me should stick with a chain, or risk having a squeeky belt drivetrain. Belts last up to 4x the life of a chain. Little to no drivetrain maintenance required. Impervious to road grime and weather. 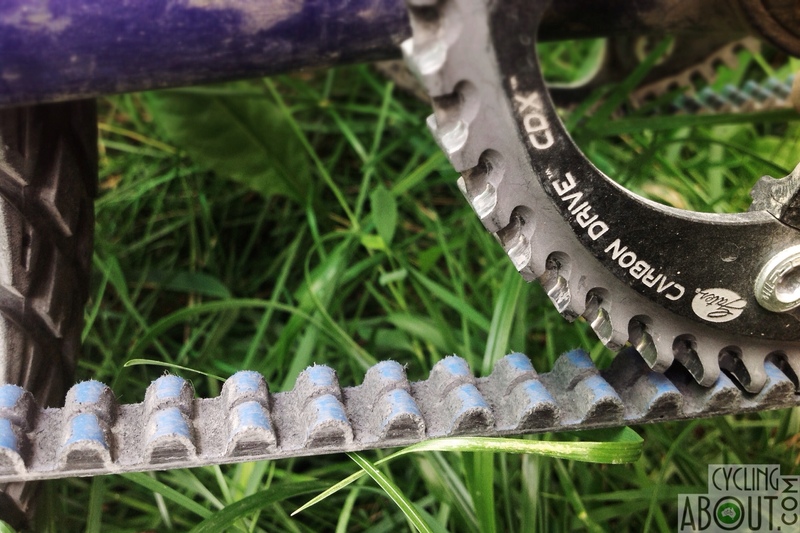 Much lighter than a chain/cog drivetrain. Getting a spare belt at any old bike shop is virtually impossible. You will need a belt compatible frame. They can make a lot of noise on sandy, dry roads. Can only be used with an internally geared hub. 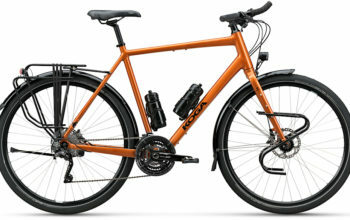 Limited drivetrain ratio options available. Belts can be mishandled if you aren't careful.